Back in March I wrote a blog about grid cut-off in the digital world. It explained things, but in a 1 page article there wasn’t room to put in the images and photos needed to really prove the points I was making. Here I have all the space I need and I’ll use parts of the original article when it’s appropriate. After years of wondering about it, sometimes noticing it and finally experimenting with it, I’ve come to the conclusion that grid cut-off isn’t mentioned anymore because no one even knows it’s happening. With film it was totally obvious because grid lines covered 50-100% of the image. That is not the case at all with digital images. This is because the post processing has grid suppression software built in that does just that – it suppresses the grid lines so they don’t appear in the image. This is a little good and a lot of bad. Good because the image don’t have annoying grid lines in it which could superimpose anatomy or pathology. Bad because the radiographer doesn’t know that there is cut-off occurring, with all the ill effects that grid cut-off creates. 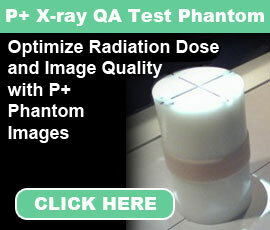 These include: decreased contrast, increased brightness, increased Exposure Index (EI) number, more technique (mAs) needed and possible decreased sharpness of detail. Figure 1 is a slide I use in my presentations on digital grid cut-off (this is why you can see the blue background of the slide at the top). 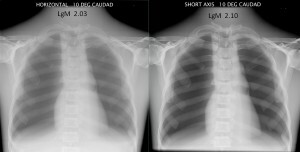 In it I’ve exposed my abdomen phantom as a lateral L-spine 3 times using the same SID and technique. The detector had a grid that runs horizontally. The image on the left is perfect with the tube parallel to the grid and no cut-off. 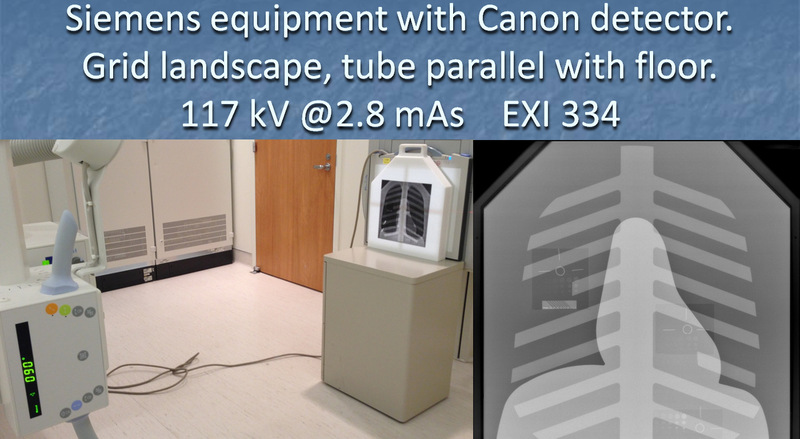 For the middle image I angled the tube 5 degrees toward the ceiling and the right image 10 degrees. 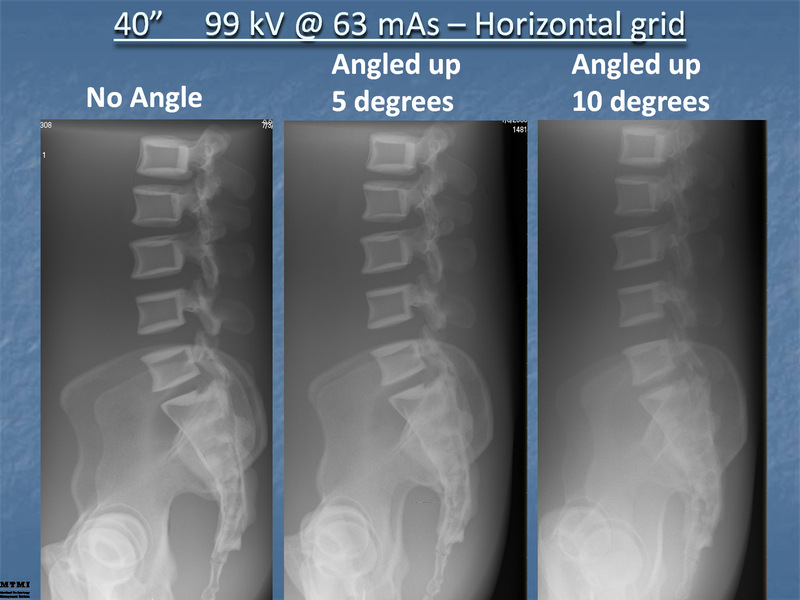 Hopefully it is very obvious how different the 5 degree and especially the 10 degree images look. Whenever you’re using a non Bucky grid (table top, either in the room or with a portable) and the image has any problem with contrast, brightness, detail or EI number, it is almost a given that you have grid cut-off. It is happening all the time and almost no one knows it. 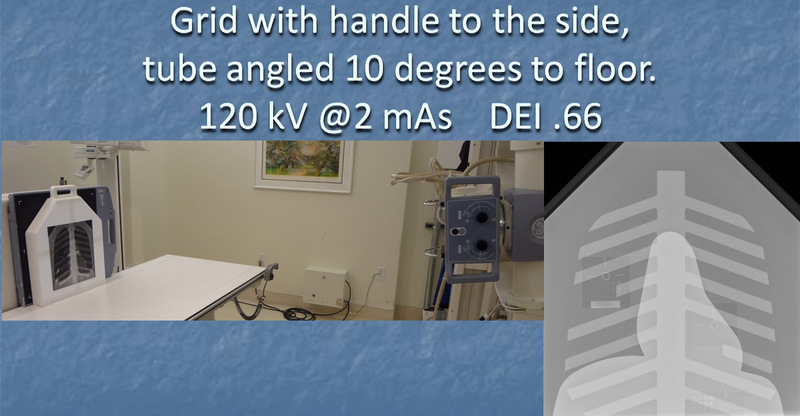 In fact, most of the portable grids that come with both CR and DR equipment are incorrect for use with AP chest x-rays. In figure 2 I have exposed my thorax phantom twice. The image on the left is using the standard grid with the lines running horizontally while the image on the right a short axis grid was used with the lines running vertically. 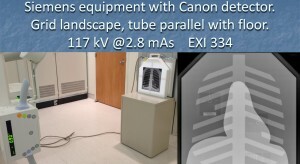 Both exposures were made with a 10 degree caudad tube angle and the same technique. As you can see the horizontal grid image ended up with an LgM (EI) number of 2.03 while the vertical grid had a 2.10. With Agfa’s LgM system .30 makes a 100% difference so the .7 LgM is a 24% difference. Also you can visually see that the horizontal image is brighter and has less contrast (meaning less radiation made it to the IR because of grid cut-off). There are many different styles of grids, but the 2 most common are with the grid lines running parallel with the floor (called a horizontal grid) and 90 degrees to the floor (called a “decubitus” or “short axis” grid). 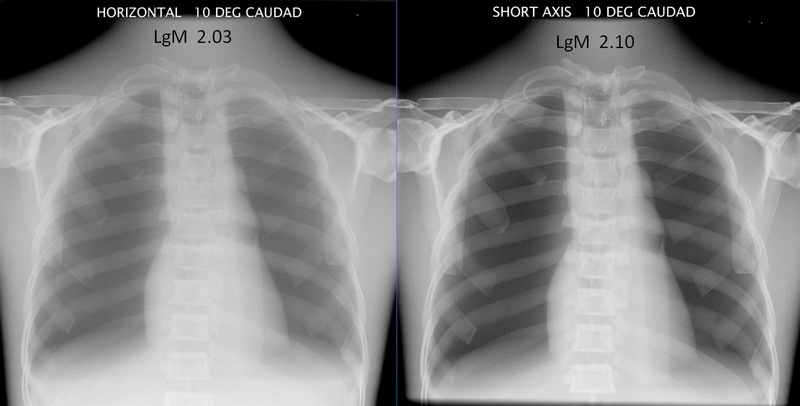 When using the grid for any AP chest work where the central ray (CR) is being angled caudally into the patient and grid, the grid needs to be short axis so that the grid lines are still parallel with the CR. the grid is landscape and the tube is perfectly parallel, so there is no grid cut-off. 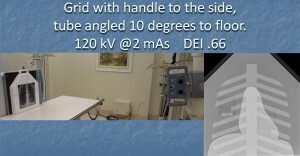 The EXI is 334.
the tube is angled 10 degrees towards the floor which would be a minimum angle used for most AP chest x-rays. The EXI is now 205 which is a difference of 39% – caused by grid cut-off. I turned the grid portrait and kept the same 10 degrees down angle with the tube. The EXI is 331 which is a 1% difference. This proves that the grid lines are running horizontally and you would need to use the grid in this position to not get grid cut-off. This final section will show the GE digital portable (tethered) detector and grid. All three exposures again used the same SID and technique. Since it has a built in handle, most of us put it behind a patient for an AP chest with the handle up since we can use gravity to let the detector/grid slide straight down. The tethered detector grid weighs 18 pounds, so this is the safest way to do it to save your shoulder. you can see the DEI is .65 with everything parallel. the handle is still up and we now have a 10 degree angle down to the floor on the tube. The DEI is now .54 which is a difference of 33%. the detector/grid has been turned sideways. 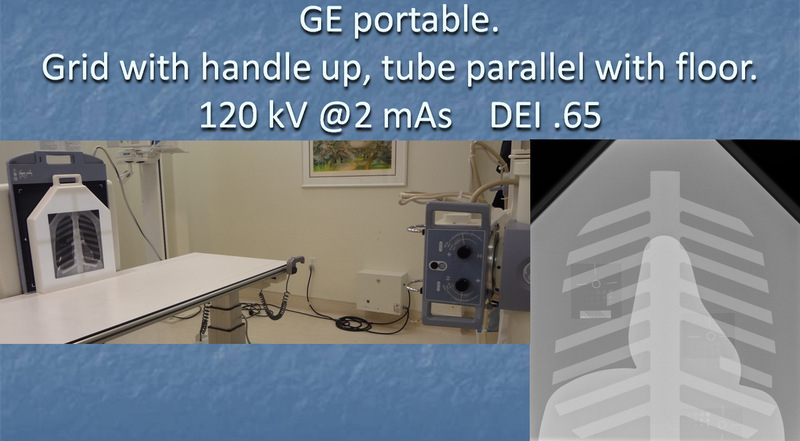 Since GE detectors are a 16.1″x16.1″ square there is not really a portrait and landscape although with the handle you could still sort of call it that. You can now see that the DEI is .66 which is about 1.5% different from figure 6. This means that GE built the grid to be used with the detector in this position. In conclusion, if you use the grid incorrectly from the way it was designed you will end up using at least 30% more mAs than necessary to get the same EI number. 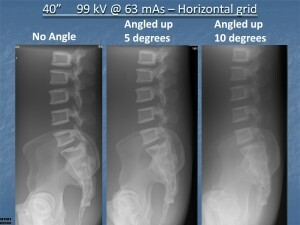 In addition, when you get grid cut-off it is possible that the following things may happen to your image: decreased contrast, increased brightness, increased Exposure Index (EI) number, more technique (mAs) needed and possible decreased sharpness of detail.